Courtesy of LSu AgCenter Mexican tarragon. Many popular herbs languish in the heat of summer, and some down right pitch a fit. Herbs that do not like our hot, wet summers include thyme, chives, sage, parsley, cilantro, French tarragon, lavender, feverfew and chamomile. Fortunately, a number of herbs tolerate, or even prefer, the torrid weather of a Louisiana summer. Some of them even make great substitutes for some of the less heat-tolerant herbs. Basil is the star of the summer herb garden. Most edible basils are varieties of the species Ocimum basilicum. The smooth-leafed types that grow 2-3 feet tall are the best known for culinary use. These are typically called sweet basil. Flavorful crinkle- and ruffle-leafed types, as well as some with purple-colored leaves, also are available. All make superb pesto and double as outstanding additions to the landscape. Seed racks, seed catalogs and nurseries offer numerous types of basil – such as sweet, cinnamon, lemon, Italian, Thai and Greek – each with a different flavor and growth habit. A gardener could plant an entire garden simply using different types of basil. Basil is a warm-season annual that thrives during our hot, humid summers in full to part sun and average garden soil. Water it during dry weather and keep beds mulched to conserve soil moisture and control weeds. Basil grows quickly from seed, which may be planted through July. Transplants may be planted in the garden through early September. Allow newly planted basil plants to grow for a while before you start to harvest. Individual basil leaves may be harvested for use, but more typically harvesting is done by pinching or cutting back the plant. Cut or pinch basil just above a pair of leaves, removing no more than a third of the plant at one time. This leaves plenty of foliage to keep the plant healthy and productive. When basil blooms, the young flower spikes can be chopped and used just like the leaves. I like to cook with French tarragon, but it simply won’t grow here in summer. 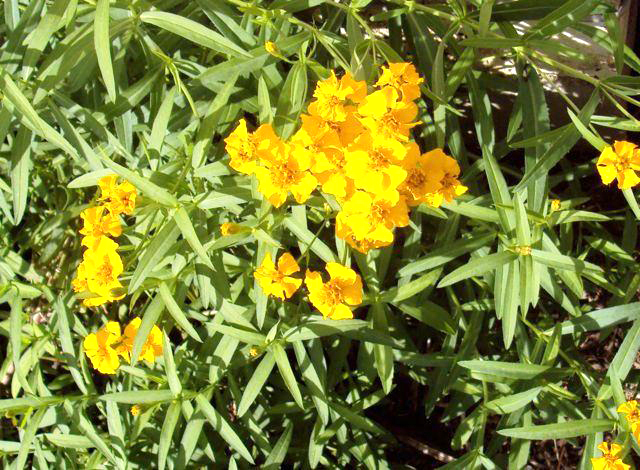 Mexican tarragon (Tagetes lucida) is native to Mexico and Guatemala. It loves the heat and humidity, providing abundant leaves for cooking all summer. The flavor is remarkably similar to French tarragon, but more intense so you should use less in cooking. Mexican tarragon is also called Mexican mint marigold. Although not related to mint, it is in the same genus with marigolds. This becomes apparent in late summer and fall when these plants burst into bloom with clusters of bright gold flowers. This reliable perennial grows in sunny spots and goes dormant when winter freezes arrive. New growth begins in March and continues all summer, culminating in a burst of edible flowers in fall. By then, plants are generally about 3 feet tall, depending on how much you have harvested. Oregano doesn’t mind the heat so much and continues to produce during the summer. But Mexican oregano (Poliomentha longiflora) has an intense oregano flavor and is so attractive I like to grow it anyway. This herb makes an attractive, small woody shrub with small, bright green leaves. In early summer it is covered with a profusion of tubular flowers in shades of pale lilac and lavender. This plant is native to Texas and apparently is indispensable for authentic Texas-style chili powder. I often use it in Italian dishes. Transplants are typically available and should be planted into well-drained, sunny locations. It looks great in containers. Chives (Allium schoenoprasum) grow little during the summer, preferring to hunker down and sulk until the weather cools. Garlic chives (Allium tuberosum), on the other hand, don’t mind the summer heat at all. Larger and more robust than chives, the flavor is somewhat milder but will do in a pinch. Garlic chives produce stalks with round clusters of white flowers that are attractive and edible. Deadhead to remove the faded flowers and prevent seed formation because this plant self-seeds freely. This evergreen, perennial herb is attractive year-round, easy to grow and a great addition to your herb garden. A couple of other herbs thrive in the heat of summer. Both of them are annuals. Sesame (Sesamum indicum) is easily grown from seeds on upright plants that reach about 3 feet. Best planted from seeds in May or early June, you might still sneak in a crop now if you’re quick. Perilla (Perilla crispum) produces a plant with purple, ruffled leaves in its most common form, similar to purple-leaf basil. Easily grown from seeds or transplants in part shade to full sun, the flavor of the foliage is unique and is used in Oriental dishes and teas. It’s so attractive I plant it every year in my flower beds.